The Secrets' original drummer, Russ Amend, would be willing to join as well! Since Bill is a bassist, Craig moved over to guitar, resulting in a Blue-Oyster-Cult-like three-guitar line-up. Craig cleaned out the basement of his apartment house and the five of them commenced to work up a set list through the Winter and early Spring. 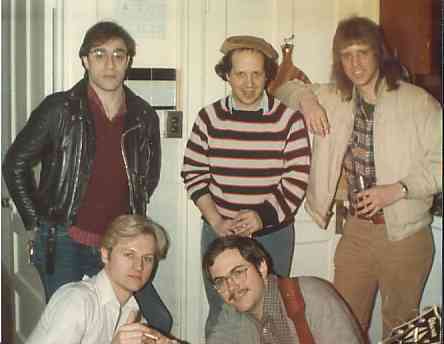 This version of the band, however, was never to see the light of day. Bill dropped out to join The Rain and Tim became very busy with some college courses. The good news was, Craig was back on bass. The bad news was, the band really needed a second guitarist. Incredibly, fate dealt an amazing trump card, as Craig's upstairs neighbor, Ken, knew a fellow who not only played guitar really good but was just as stuck in the 60s as the rest of the band! This mystery man turned out to be Eric Lubstorf who showed up to "jam" with Bernie, Craig and Russ. Eric's letter-perfect rendition of the twelve string solo from The Byrds' "Feel A Whole Lot Better" cinched his position in rock 'n' roll history. A Mystic Eye was born!